AOL Patch – I Say! As my local friends from San Leandro (the town I live in) well know, I participate a lot in local politics and write and comment on my San Leandro blog and Facebook page about anything going on in this town. I’m also a very active participant in the San Leandro Patch, an online hyper-local news portal owned by AOL (which wants to become a media company). Here again, I comment about anything and everything. One thing I commented about last night was a short frilly article on what some moms tell their kids about religion. My comment(s) were left alone, but when a gay atheist man commented about his own experience raising a son and how he feels about the Church’s stands on gay marriage, his post was quickly deleted because the editor considered it an attack (won’t say how or on whom, however). In any case, I am posting his comment here so that everyone can read it. I am an atheist and I raised my son to find his own way with religion, he went to quite a number of local church youth-oriented faith events in his teens and I did not pressure him to believe or doub. He has become a wonderfully warm and caring kid, and we both have found our moral compass without any connection to the Judeo-Christian belief system. We are good people because that is the right thing to do, not because a book tells us to do it, or because we live in constant fear of an eternity in hellfire. As a gay man I find the ongoing religious demonization and intolerance toward LGBT families simply outrageous and so NOT what Jesus would do. The Catholic church leads the pack in this regard, Archbishop Dolan makes weekly statements about the horrors of allowing gay couples to get married, while at the same time his church seems to be maintaining the largest group of pedophiles the world has ever known. 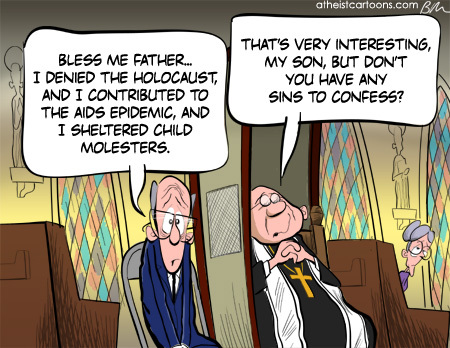 The hypocrisy that exists in the Catholic church is appalling, an organization that prides itself on ‘justice’ clearly does not mean if it you are a child or gay, and heaven help you if you are both. In closing I will paraphrase Caria: “At the end of the day what is most important to me is that my little boy grows up to be a man who is secure in his heart, his mind and his faith that we as humans should love one another.